Hedge funds are known to underperform the bull markets but that’s not because they are bad at investing. Truth be told, most hedge fund managers and other smaller players within this industry are very smart and skilled investors. Of course, they may also make wrong bets in some instances, but no one knows what the future holds and how market participants will react to the bountiful news that floods in each day. Hedge funds underperform because they are hedged. The Standard and Poor’s 500 Index returned approximately 13.1% in the first 2.5 months of this year (including dividend payments). Conversely, hedge funds’ top 15 large-cap stock picks generated a return of 19.7% during the same 2.5-month period, with 93% of these stock picks outperforming the broader market benchmark. An average long/short hedge fund returned only 5% due to the hedges they implement and the large fees they charge. Our research covering the last 18 years indicates that investors can outperform the market by imitating hedge funds’ stock picks rather than directly investing in hedge funds. That’s why we believe it isn’t a waste of time to check out hedge fund sentiment before you invest in a stock like Campbell Soup Company (NYSE:CPB). Campbell Soup Company (NYSE:CPB) shares haven’t seen a lot of action during the third quarter. Overall, hedge fund sentiment was unchanged. The stock was in 29 hedge funds’ portfolios at the end of the fourth quarter of 2018. The level and the change in hedge fund popularity aren’t the only variables you need to analyze to decipher hedge funds’ perspectives. A stock may witness a boost in popularity but it may still be less popular than similarly priced stocks. That’s why at the end of this article we will examine companies such as National Oilwell Varco, Inc. (NYSE:NOV), PTC Inc (NASDAQ:PTC), and The Gap Inc. (NYSE:GPS) to gather more data points. We’re going to analyze the new hedge fund action surrounding Campbell Soup Company (NYSE:CPB). What does the smart money think about Campbell Soup Company (NYSE:CPB)? At Q4’s end, a total of 29 of the hedge funds tracked by Insider Monkey held long positions in this stock, a change of 0% from the second quarter of 2018. 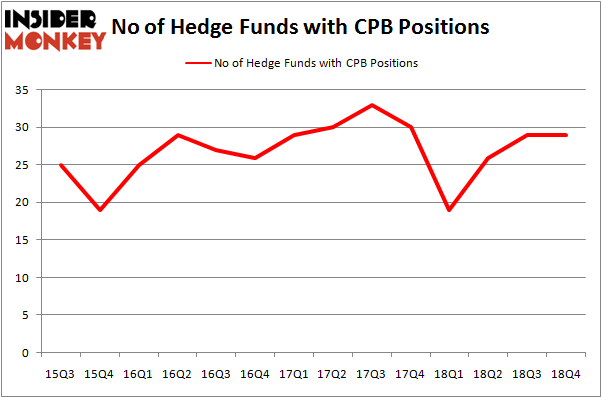 The graph below displays the number of hedge funds with bullish position in CPB over the last 14 quarters. So, let’s find out which hedge funds were among the top holders of the stock and which hedge funds were making big moves. 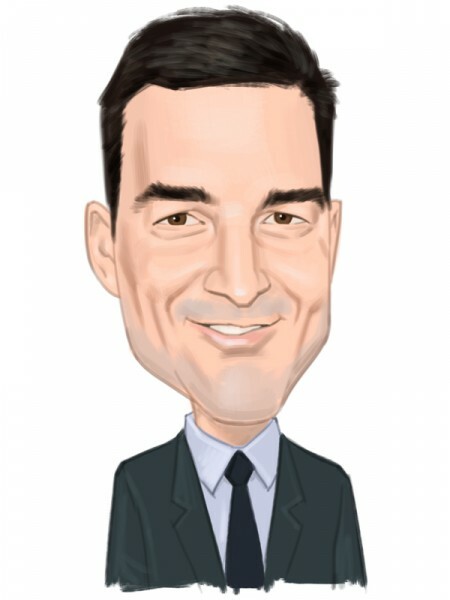 When looking at the institutional investors followed by Insider Monkey, Third Point, managed by Dan Loeb, holds the biggest position in Campbell Soup Company (NYSE:CPB). Third Point has a $692.8 million position in the stock, comprising 10.6% of its 13F portfolio. On Third Point’s heels is Citadel Investment Group, managed by Ken Griffin, which holds a $30.6 million call position; the fund has less than 0.1%% of its 13F portfolio invested in the stock. Some other members of the smart money with similar optimism consist of D. E. Shaw’s D E Shaw, Mario Gabelli’s GAMCO Investors and Steve Cohen’s Point72 Asset Management. Since Campbell Soup Company (NYSE:CPB) has witnessed bearish sentiment from the aggregate hedge fund industry, we can see that there lies a certain “tier” of funds who were dropping their full holdings by the end of the third quarter. At the top of the heap, Steven Boyd’s Armistice Capital sold off the biggest investment of the 700 funds watched by Insider Monkey, valued at close to $73.3 million in stock, and James Dinan’s York Capital Management was right behind this move, as the fund dumped about $28.5 million worth. These transactions are important to note, as aggregate hedge fund interest stayed the same (this is a bearish signal in our experience). Let’s go over hedge fund activity in other stocks – not necessarily in the same industry as Campbell Soup Company (NYSE:CPB) but similarly valued. These stocks are National Oilwell Varco, Inc. (NYSE:NOV), PTC Inc (NASDAQ:PTC), The Gap Inc. (NYSE:GPS), and F5 Networks, Inc. (NASDAQ:FFIV). This group of stocks’ market caps resemble CPB’s market cap. As you can see these stocks had an average of 24.25 hedge funds with bullish positions and the average amount invested in these stocks was $823 million. That figure was $817 million in CPB’s case. PTC Inc (NASDAQ:PTC) is the most popular stock in this table. On the other hand The Gap Inc. (NYSE:GPS) is the least popular one with only 20 bullish hedge fund positions. Campbell Soup Company (NYSE:CPB) is not the most popular stock in this group but hedge fund interest is still above average. This is a slightly positive signal but we’d rather spend our time researching stocks that hedge funds are piling on. Our calculations showed that top 15 most popular stocks among hedge funds returned 19.7% through March 15th and outperformed the S&P 500 ETF (SPY) by 6.6 percentage points. Unfortunately CPB wasn’t in this group. Hedge funds that bet on CPB were disappointed as the stock returned 10.3% and underperformed the market. If you are interested in investing in large cap stocks, you should check out the top 15 hedge fund stocks as 13 of these outperformed the market.